In general, poker players are expected to be playing when vacating a seat at the table. Most online poker sites and live card rooms allow you to remain seated at a table while not participating in hands for a certain period of time. Under most circumstances, the time limit will be 10-minutes before you will be removed from the table. In blind games, you are prompted to place any missed blinds when you return to the game. To not participate, you can wait for the blinds to come around again to you. In live poker games, you just have to notify the dealer you want to leave the table for a short period of time. If you’re playing online poker, simply click on the “sit out” box, you will keep the same seat at the table, and when you want to be included back in the action, simply click on “sit in”. 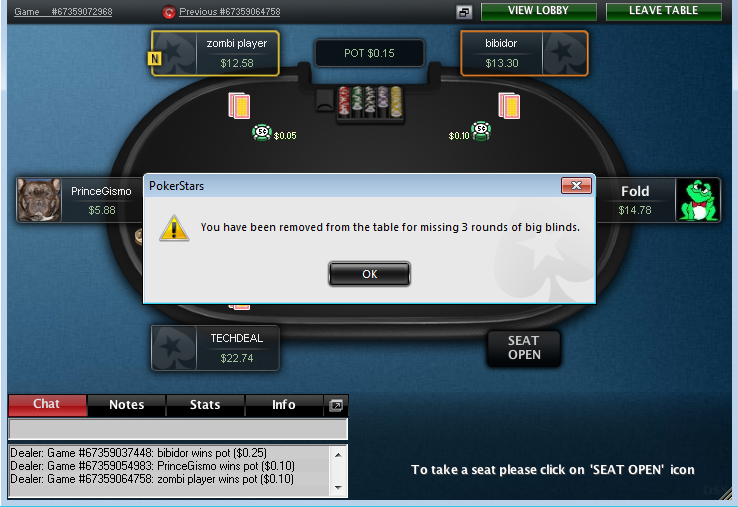 If you have been away from the table for too long on PokerStars, this is the message that will be displayed.